The popular and powerful Thieves essential oil blend is a proprietary combination of Cinnamon Bark, Lemon, Rosemary, Eucalyptus, and Clove essential oils. • Clove was one of the first spices to be traded and can be traced back as far as 1721 BC. It was one of the most precious spices of the 16th and 17th centuries. • Eugenol, the main constituent of Clove essential oil, has been heavily researched for its beneficial properties. • Eucalyptus originates in Australia, and there are over 900 different species of eucalyptus. • The rosemary herb was known by ancient cultures as the herb of memory. Young Living’s Thieves essential oil blend was inspired by the legend of four 15th-century French thieves who formulated and wore a special aromatic combination of clove, rosemary, and other botanicals that they believed provided protection while they were stealing. French authorities recognized that there was such value in this mixture that upon the thieves’ capture, they received a more merciful punishment on condition that they divulge the ingredients in their secret formula. Thieves essential oil blend has a warm, spicy scent. Diffuse it for a fresh, clean aroma around the house or apply it topically for its cleansing properties. •Refresh musty carpets by adding 5 drops of Thieves to a cup of baking soda; combine well and let sit overnight until the oil is absorbed. Sprinkle over carpets and vacuum thoroughly. •Apply Thieves to the bottoms of your feet to refresh yourself after vigorous activity. •Diffuse it around the classroom or in your home for a fresh, clean fragrance and to neutralize the air from strong odors. •Add a few drops to your dishwater or dishwasher to eliminate odors and boost cleaning. Young Living Thieves Vitality™ was specially formulated so that you and your family can enjoy the benefits of Thieves essential oil internally. The difference between Thieves Vitality and Thieves essential oil is simply the labeling and recommended usage. The essential oil in the Vitality product line is the same 100 percent pure, therapeutic-grade essential oil as the topical/aromatic counterpart; however, Thieves Vitality is labeled for dietary use and is the appropriate product to use when sharing dietary uses with others. •Try mixing Thieves Vitality and Oregano Vitality for an extra winter kick! •Take a shot of NingXia Red® with a drop of Thieves Vitality for a quick, spicy boost to your daily NingXia Red shot. •Add Thieves Vitality to food to enhance the flavor of tea, oatmeal, granola, etc. •Add 1 drop of Thieves Vitality and 2 drops of Orange Vitality as a refreshing flavor to complement your favorite beverage. The biggest pollutants in our home are fabric softener, dryer sheets, air freshener plug-ins, and candles. You are literally poisoning your family every day with the stuff in your home that you can't pronounce, like your bright blue dish soap, the cleaner you use for your kitchen counters, processed food, and more. Health and safety data only exists for 15 percent of all the chemicals out there, even though so many are known to cause asthma or endocrine disruptions. Essential oils are a better way. They are totally chemical free, steam distilled or cold pressed from pure plants. There's nothing in them but that one oil, whether it is lemon, tangerine, lavender, peppermint, or others. There are over a million uses for essential oils: cleaning supplies, personal care products like toothpaste and deodorant, in the diffuser, oil-infused nutritional supplements. Listen to the 22 minute audio below to learn how to kick the chemicals in your home to the curb. Loaded with facts, science and statistics, you'll never look at your cabinets at home the same way again. You are the gatekeeper of your house! Learn simple, easy steps to protect your family and take charge of what's in your house. 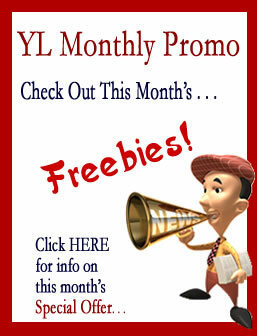 TO Purchase one of the Premium Starter Kits, become a Young Living Member by Clicking the Link at the top of this page. 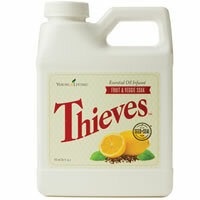 Thieves Oil Blend This proprietary essential oil blend contains essential oils that defend and protect. It is highly effective in supporting the immune system and good health. This blend is an integral ingredient in Dentarome and Dentarome Plus toothpastes. How to use: Diffuse for short periods of time (1/2 hour or less) in the work or home environment. Apply to the bottom of the feet or dilute with V-6 Mixing Oil or Massage Oil Base for a stimulating massage under the arms and on the chest at the base of the neck. Ingredients: Clove (Syzygium aromaticum), lemon (Citrus limon), cinnamon (Cinnamomum verum), Eucalyptus radiata, and rosemary (Rosmarinus officinalis). Thieves Vitality Oil Blend With Thieves Vitality you'll have a quick and easy way to balance your busy life and your wellness. With Young Living's Thieves Vitality essential oil you can support overall wellness and a healthy immune system with just a few drops. 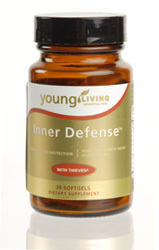 Inner Defense Young Living's Inner Defense supports systemic defenses and contains potent essential oils like oregano, thyme, and Thieves which are rich in thymol, carvacrol, and eugenol for immune support. The liquid softgels dissolve quickly for maximum results. Ingredients: Thieves Essential Oil Blend, Eucalyptus radiata leaf, Rosemary leaf, O3 Super Blend, [Oregano leaf, Thyme leaf, Citronella aerial parts], virgin coconut oil, gelatin, beeswax, and lecithin. Thieves Household Cleaner Thieves Household Cleaner is an all-purpose, concentrated solution that contains all-natural ingredients formulated to distribute the power of essential oils in your home while cleaning virtually any surface in your home. How to use: Dilution ratios: light degreasing 60:1; medium degreasing 30:1; heavy degreasing 15:1; floors 100:1; walls 30:1; upholstery, fabrics, carpet spotting 40:1; carpet 100:1; glass 320:1; pots and pans; 100:1 hand cleaner 1:1. Ingredients: Proprietary suspension of safe surfactants (wetting agents) and Thieves Oil. Thieves Automatic Dishwasher Powder - Give your dishes the clean they deserve with Thieves Automatic Dishwasher Powder! Harnessing the concentrated power of Thieves, Lemongrass, and Orange essential oils, naturally derived soapberries, and two cleansing enzymes, our plant-based cleaning powder for automatic dishwashers tackles even the dirtiest dishes with ease. Thieves Dish Soap - With naturally derived ingredients, Thieves Dish Soap effectively cleans your dishes without chemicals, dyes, or synthetics. Young Living pure essential oils - Thieves, Jade Lemon, and Bergamot work with other plant-based ingredients to leave your dishes sparkling clean. 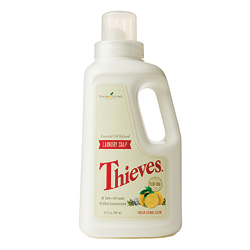 Thieves Laundry Soap - With a plant-based formula, Thieves Laundry Soap gently and naturally washes your clothes, leaving them truly clean without any chemical or synthetic residue. Natural enzymes and powerful essential oils add to the formula's strength to leave your clothes fresh and clean with a light citrus scent. Thieves Cleansing Bar Soap is fragrant with the rich aroma of clove (Syzygium aromaticum), lemon (Citrus limon), cinnamon bark (Cinnamomum verum), eucalyptus (Eucalyptus radiata), and rosemary (Rosmarinus officinalis). Thieves Hard Lozenges - refresh your mouth and breath and provide soothing relief for your throat. Lightly sweetened with the low-glycemic sugar maltitol, these lozenges deliver the power of Thieves, the university-tested essential oil blend, along with the flavor of natural peppermint and lemon essential oil. How to use: Dissolve 1 lozenge in mouth as needed. Caution: Swallowing lozenges whole may cause choking. Thieves Essential Oil Infused Cough Drops - The power of Thieves and menthol in a cough drop! The triple-action formula of Thieves Cough Drops offers comfort by relieving coughs, soothing sore throats, and cooling nasal passages. Minty, spicy, and sweet without processed sugar, dyes, artificial flavors, or preservatives, these cough drops are made with naturally derived ingredients, including Young Living's pure, therapeutic-grade essential oils and menthol from peppermint. These tasty cough drops are easy to take anywhere you may need relief. Keep some in your purse, laptop bag, or next to your bed at night so they're always on hand to soothe. Thieves Spray - contains all-natural ingredients formulated to distribute the power of essential oils in your home and during travel. Thieves spray comes in a small bottle that you can use on door handles, toilet seats, or any surface that needs protection from germs. Ingredients: Pure grain alcohol, deionized water, Thieves essential oil blend, fractionated coconut oil and soy lecithin. 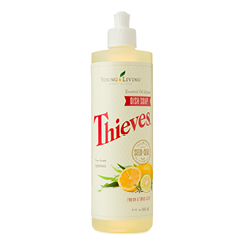 Thieves Foaming Hand Soap - Thieves Foaming Hand Soap will cleanse the skin with the essential oil blend Thieves, pure lemon and orange essential oils, aloe, Ginkgo biloba, and vitamin E. Dispensed as a rich foam, Thieves Foaming Hand Soap contains gentle ingredients so it can be used often without drying or stripping the skin. Ingredients: Water, decyl glucoside, cocamidopropyl hydroxysultaine, syzygium aromaticum (clove) flower bud oil, citrus limon (lemon) peel oil, cinnamomum verum (cinnamon) bark oil, eucaplyptus radiata leaf oil, rosmarinus officinalis (rosemary) leaf oil, citrus aurantium dulcis (orange) oil, aloe barbadensis leaf juice, tocopheryl acetate, ginkgo biloba leaf extract, retinyl palmitate, camellia sinensis leaf extract, cetyl hydroxyethylcellulose, citric acid, caprylyl glycol, ethylhexylglycerin, and hexylene glycol. Thieves Waterless Hand Purifier Thieves Waterless Hand Purifier is an all-natural hand purifier designed to cleanse and refresh the hands. Thieves Waterless Hand Purifier can be used by adults and children to keep hands clean and promote good hygiene, without the use of water. Dermatologist tested. Ingredients: Denatured ethanol SD-38B (denatured with Peppermint Essential Oil), water, aloe barbadensis leaf, vegetable glycerin, syzygium aromaticum (clove) flower bud oil, citrus limon (lemon) peel oil, cinnamon verum (cinnamon) bark oil, eucalyptus radiate leaf oil, rosmarinus officinalis (rosemary) leaf oil, and hydroxylpropyl cellulose. Thieves Waterless Hand Purifier Thieves Waterless Hand Purifier is an all-natural hand purifier designed to cleanse and refresh the hands. The larger 7.6 oz. bottle is ideal for every room in your house. Making a family-sized bottle readily available could increase your family's use and motivate children to be proactive in keeping their hands clean. Use Thieves Waterless Hand Purifier as an optimal tool when trying to increase your family's overall hygiene. Thieves Wipes - infused with the renowned benefits of Thieves essential oil blend. 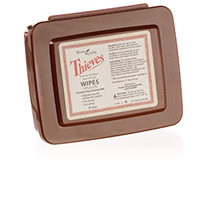 Thieves wipes can be used to cleanse the skin or any surface that needs cleaning. ESSENTIAL OILS: Clove, Cinnamon Bark, Rosemary, Lemon, Eucalyptus Radiata Note: Not for use on infants or sensitive areas of the body. Caution: Not for use on infants or sensitive areas of the body. Ingredients: Pure grain alcohol, deionized water, Thieves, coconut oil and soy lecithin. Thieves Fruit & Veggie Soak - Young Living's Fruit & Veggie Soak safely and effectively washes produce with the cleansing power of three exclusive essential oil blends DiGize, Thieves, and Purification. When combined with the other naturally derived ingredients, produce is easily and conveniently cleaned. Thieves Fruit & Veggie Spray - Young Living's Fruit & Veggie Spray safely and effectively washes produce with the cleansing power of three exclusive essential oil blends DiGize, Thieves, and Purification. When combined with the other naturally derived ingredients, produce is easily and conveniently cleaned. 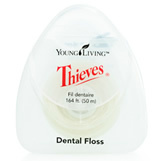 Thieves Dental Floss - Dental floss infused with Thieves and peppermint essential oil. Ingredients: Thieves essential oil, peppermint essential oil, soy wax, bees wax and nylon. Thieves Fresh Essence Plus Mouthwash Thieves Fresh Essence Plus Mouthwash contains a special formulation of essential oils that provides incredibly fresh breath. The unique liposome technology (using soy-derived lecithin) binds the essential oils to the mucous membrane inside the mouth for longer-lasting effects on teeth and gums. How to use: Gargle thoroughly morning and night. Ingredients: Water, Mentha Piperita (Peppermint) Leaf Water, Melissa Officinalis Leaf Water, Colloidal Silver, Mentha Piperita (Peppermint) Oil, Lecithin, Polysorbate 80, Stevioside, Syzygium Aromaticum Flower Bud Oil, Mentha Spicata (Spearmint) Leaf Oil, Citrus Limon (Lemon) Peel Oil, Cinnamomum Verum Bark Oil, Vetiveria Zizanoides Root Oil, Eucalyptus Radiata Leaf Oil, Rosmarinus Officinalis (Rosemary) Leaf Oil, and Tocopherol (Vitamin E).